*Inspiring ideas for creating high-functioning decks, patios, pathways and buildables that will become the backbone of your design. *A style guide to help you match your home to the hardscaping and landscaping that will best complement it and stand the test of time. 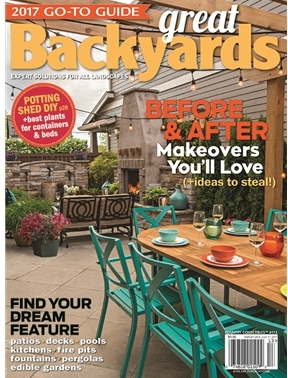 *Incredible before and afters that will have you rethinking the boundaries of what is possible in your yard. *Planting guides for beds, containers, edible gardens and more, along with advice on which plants offer the best bang for your buck.